Who says salad has to be dull and sad and unappetizing? Appliance brand Electrolux shares these three yummy salad recipes that are as healthy as they are tasty. 1. Peel and thinly slice the shallots and keep about 1/3 aside. 2. Heat up a small pan on medium and add olive oil. Add 2/3 of the small shallots and stir constantly. Watch them closely, brown but don’t burn them. 3. Remove pan from heat and place on paper towel to absorb the excess oil. They will continue to brown a little more. Set aside to cool. 4. Peel and dice the mango into 1 cm cubes. Deseed the red chili pepper and thinly slice them lengthwise. 5. Wash and pick all the leaves off the fresh Thai basil. 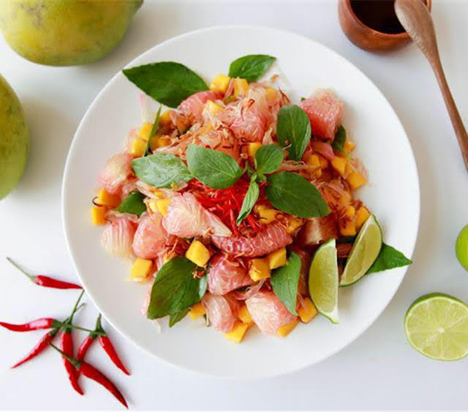 Place the pomelo, mango, basil, half the fried shallots, and the raw shallots in a mixing bowl. 6. Try to keep the pomelo pieces about an inch in size, not too big and not too small. 7. Mix coconut sugar, fish sauce, distilled white vinegar, and juice of lime to make the dressing. Pour over pomelo mixture and gently toss. 8. Slice ¼ inch off each end of the other lime cut it in half, lengthwise. Set one of the halves cut side-down on the cutting board, slice it at an angle, lengthwise to make lime wedges and set aside. 9. Taste and add more dressing if necessary. Plate with lime wedges and garnish with remaining fried shallots and thinly sliced chilies. 1. Take the salmon and put it into an airtight container. Cover it with sea salt evenly. Add some ground black pepper and extra virgin olive oil. Leave it for 6 hours in the refrigerator or overnight. 2. Smash avocados with a fork and season with lemon juice and salt and pepper. 3. Add lettuce and cherry tomatoes on the plate. 4. 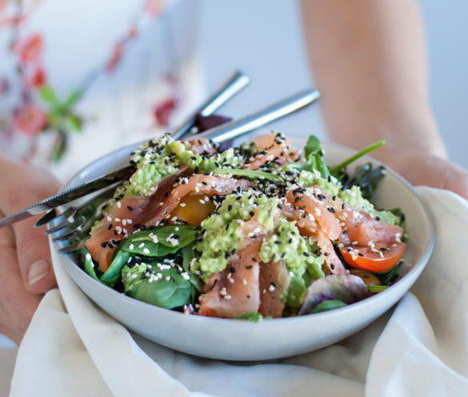 Cover salad with avocado sauce, and add sliced salmon. Drizzle with lemon juice and sprinkle sesame seeds. 1. Remove crusts from whole wheat bread. Slice whole wheat bread into triangles and arrange on the bottom of springform pan. Depending on the size of your bread and pan, the number of slices you use for each layer will vary. 2. Using the back of the spoon, spread hummus over the bread. Peel and thinly slice the English cucumber and arrange over the hummus. 3. Spread butter on the whole wheat bread. Arrange bread, butter side up over the cucumbers then top with smoked salmon. 4. Top smoked salmon with thinly sliced Romaine lettuce. 5. Place another layer of bread over the Romaine. Leave cake to chill in the fridge for 2-3 hours. 6. Remove cake from the fridge and remove springform pan. 7. Combine cream cheese and sour cream. The mixture should be similar in texture to frosting. If your mixture is too runny, you may need to run it through a strainer. Using a spatula, frost the cake with the cream cheese mixture. 8. Use spatula to spread icing on the side of the cake. 9. Once cake is frosted, decorate. 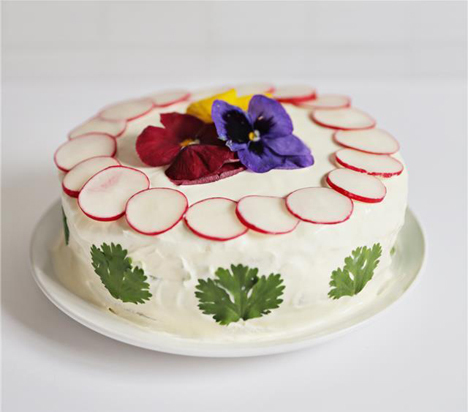 Use edible flowers, radish, and fresh parsley. 10. Carefully slice and serve immediately.